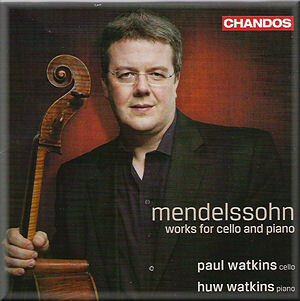 Mendelssohn’s complete original works for cello and piano - excluding transcriptions of works for other combinations - fit very neatly onto a single disc. More importantly, they form an excellent and well contrasted programme. The range encompasses the concise but very varied Op. 17 variations and the brief but memorable Op. 109 to the two Sonatas which are amongst the composer’s most attractive works. It is therefore surprising that there are relatively few recordings available, but all the more pleasing to listen to such a superb version as Chandos have produced here. Paul Watkins is above all else a musician of the utmost subtlety, taste and insight. His experience as an orchestral and chamber music player stands him in good stead. It helps ensure that what we hear is a real partnership with his brother, rather than two virtuosi showing off in the undoubtedly very showy music that Mendelssohn gives them at times. There is a real sense of dialogue throughout. The composer may have referred to Op. 109 as a Song without Words but the sheer eloquence of the playing makes the lack of words no obstacle to the sense of narrative conveyed. Throughout the disc subtle phrasing and timing convey a real sense of conversation of a very deep kind and on a very civilized level. The two Sonatas, amongst the composer’s best works, are played with real conviction and character. Paul Watkins’ ability to vary tone colour and his mastery of rubato prevents any hint of routine even in the long opening movement of Op. 45. Op. 58 launches, as it should, with an outburst of joy, and musical concentration is never allowed to lapse. The booklet includes an excellent note about the music by Bayan Northcott and the recording is realistic and well balanced. All in all this is a disc of superb quality which should do much to enhance even further the reputation of these two fine players. The nineteenth century critic the Rev H Haweis (author of Music and Morals) pointed out that words set in Elijah “And after the fire a still small voice; and in that still voice onward came the Lord” could be applied more generally to the music of Mendelssohn. It is indeed the rapt quality of the music and music-making here – even when the music is fast and full of notes – that is so impressive.